Jacob Feiring's portrait of Samantha Martin and her cat circus is a joy. When Samantha was growing up she always loved animals. 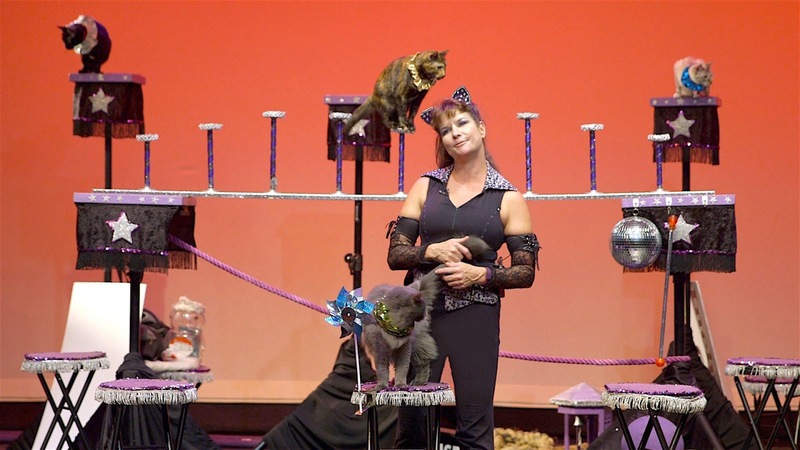 Knowing she wanted to be an animal trainer from an early age she started steered away from the typical career path and took to performing with animals. Over time she moved from having an exotic zoo to performing with cats. The film follows Samantha over the course of five years and we watch as her fortunes ebb and flow and she debates whether or not to continue performing. SAMANTHA'S AMAZING ACROCATS is a small gem of a film. Covering a lot of territory over the course of an hour we really get to know Samantha and the life she leads. It's a tough life, Samantha and her cats are on the road over 200 nights a year and things are not always peachy, with some shows being rather empty and others oversold (usually after one of her TV appearances). We can see the physical and emotional toll it takes on her and at times as she talks about the breakdown of her body and her pondering if she really wants to be on the road forever. If you're coming into the film expecting a film full of cat tricks you are going to be disappointed. The film is firmly about Samantha and her life so while there are cats in most of the film, you are not going to get an hour long cat video. Instead what we get is a portrait of performer who is doing things in the old school way of schlepping across the country to where the gig are. Its a way of a way of life that's as old as show business. It's clear that the barnstorming days of vaudeville haven't completely died. Director Feiring has made a wonderful portrait of someone who is doing what they love despite knowing the difficulties involved. In it's way it lifts your soul because it lets the audience know that if you find something that you love to do that you don't have to give it up. SAMANTHA'S AMAZING ACROCATS is one the highlights of this years DOC NYC and is recommended when it plays Friday. FOr tickets and more information go here.